YouTube sensations, the Charlie Bit My Finger kids are all grown up. 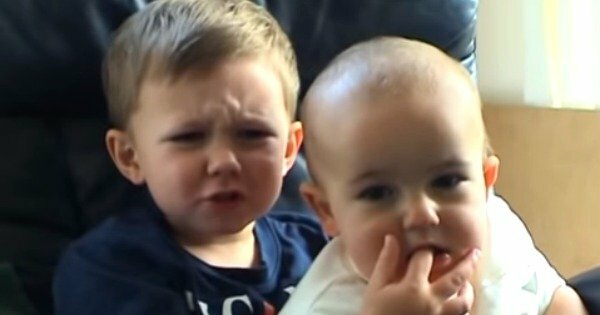 The kids from the viral 'Charlie bit my finger" video are all grown up now. If you’ve ever used the internet you might have watched a little video called ‘Charlie bit my finger’ that was once doing the rounds on YouTube. In the clip uploaded by the boys’ parents, Shelley and Howard Davies-Carr, adorable British toddler Harry complains as his little brother Charlie bites his finger. Here’s the clip in case you need a refresher. It was cute, it was funny, it was… 10 years ago. The video has been viewed 850 million times – still the 90th most watched video on the platform – and has reportedly earned the family more than $1 million since it was uploaded in May 2007. And now the two little stars of the show are preteens and have recreated the classic image of Charlie, 11, sitting on his 13-year-old brother Harry’s lap. Well they’re no longer babies, but still pretty damn adorable.